If you have an inflatable paddle board or your thinking about getting one.. You NEED this!!! Inflatable SUPs are awesome; you can take them anywhere and store them in very small places. The number one complaint for all the boards we have come across has been pumping them up. 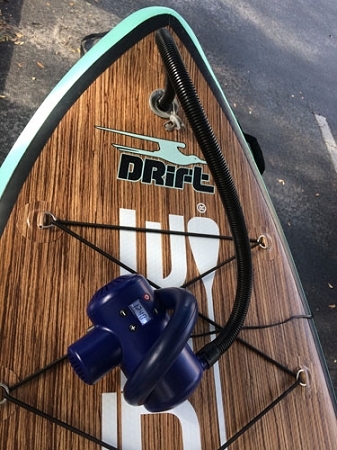 Now you can effortlessly pump up you SUP with this automatic pump. The pump works for almost all of the SUPs out there using the standard inflation valve. All you do is attach the pump set the desired PSI and wait for it to fill up. We use inflatables all the time and its changed our lives quite a bit!! This pump inflates to a max of 15 PSI. When you set the PSI it sometimes goes over .1 to .2 PSI before it cuts off. Test your unit and adjust your setting accordingly to end up with the desired PSI. The manual states that the pump shouldn’t be run for longer than 10 minutes continuously (plenty of time for one large board or two smaller ones). If you’re planning on inflating multiple SUPs you might want one for each inflatable board. We also have a few other innovative solutions for inflating your SUP that are equally as cool that you might want to check out! High Pressure SUP Inflator: Valve adapter that turns your SUP Valve into a standard tire valve that can be pumped up with and tire compressor. K-Pump: Multiple stage SUP hand pump that is a lot more rugged and easy than your standard pump that comes with 99% of the iSup inflatable paddle boards out there.